Paula is a native Texan and has lived in Austin since her family moved here when she was in the eighth grade. Prior to her transition in the late '90s, she worked as a Licensed Substance Abuse Counselor. She worked for the Texas Commission on Alcohol and Drug Abuse (TCADA) under the administration of then governor Ann Richards. She developed substance abuse treatment programs at various central Texas facilities including St. David's Pavilion and Solutions Counseling. Following "coming out" as transgender, she left the substance abuse field to focus on her transition. She became involved in trans and queer activism and was a founding member of the Transgender Education Network of Texas and has served on the board of directors for the Austin Gay and Lesbian International Film Festival. 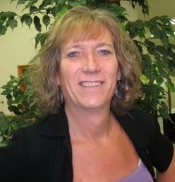 Paula was the first openly transgender woman in the University of Texas, School of Social Work. She completed her Master of Science in Social Work. While there, she was a student co-chair for the Dean's Advisory Committee on Social Justice and was appointed as one of the Dean's Ambassadors. Paula completed her field internships at Waterloo Counseling and Out Youth Austin. She was honored to be asked to deliver the commencement address for her graduating class. Paula and her wife Phaedra live with their rescue dog, Taylor, in the heart of Austin.